Regardless of whether it’s the next 1984, or just the simple version of your life, our stories are the truest, most unadulterated versions of ourselves. It’s a spark that no one else has handed us, uncluttered by other’s opinions. What’s more, it’s the thing that grabs people’s attention. We all have a story. And it’s time that app developers in every market stop reacting, and start sharing their own. In fact, it is the authenticity of this story that is going to help us recruit talented developers, even when you can’t compete with market rates. It’s what is going to compel our first angel investors to take the plunge. No matter what anyone tells you about valuations, metrics, and growth–none of these can ever replace the importance of your story. 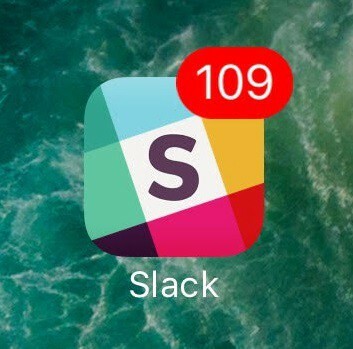 To ensure crippling anxiety, enable all your Slack notifications. Unread emails start piling up 50 at a time with meetings and support tickets. Your team Slack notification badge never stops flashing for long. No matter how you goad yourself to do otherwise, you react to everything because you’re a responsible entrepreneur that takes total ownership, afraid of something important slipping through the cracks. You take Pomodoro-style breaks and meditate, but these only serve as distractions. This tends to work well in the short term. Your team loves that you’re on the ball and always reachable. Your customers love that the founder gets back to them. You land some deals because you hustle faster and harder than the monoliths. Before you know it, you start suffering some of these symptoms: You’re waking up with anxiety about the flood of bold text in your gmail. You’re adding new features to appease stakeholders. When you try to recall your company’s story, it’s become a mutation of the original version, with new oddities and a focus on buzzwords and titles. You rationalize it as “maturity”. Your company is just growing up, facing reality, like we all have to. Being reactive eroded my story. Being reactive in this way has torn at the folds of my personal story many times. And I was pulled in different directions by stakeholders who had forgotten my story as much as I had. Subsequently, my story was no longer mine; it was a pitch, catered for context. Inauthentic. Not me. Then I found a strategy that changed everything for me. And for that, I have Mr. Tony Robbins and his daily process for problem solving to thank. 3) Strategize how to solve the problems. It was “number two” that really caught my eye. I’d never heard of story-telling used as a daily tool before, nevertheless as a tool that would eventually give rise to, and motivate, my later strategic aims. The furthest I’d gotten was getting into a good state, then jumping right back into my shark-infested inbox. This time, after reading about his process, I knew it was time for this JT to start bringing his story back. So, I followed my heart, stopped reacting, and started telling my story. First, I would start every morning aligning with a positive state, telling a clear story about where I want to be. Then, and only then, I would use that story to prioritize my day. During this time to myself, I would not respond to anyone or anything online. Sometimes, I wouldn’t even look at my phone. Notice that my story focused on design even though we’re a development firm. So why did I choose this as our story, and how did this story impact #3 on this list: Strategy? I realized there were a ton of ways that we can grow by 10% but not so many where we can potentially grow by 10x (without getting into a hiring bloodbath). When I evaluated our clients’ visceral reactions to our designs, I remembered the very unfortunate but true cliche: 99% of our clients don’t care how you get it done, just that it looks good and that it gets done right. Because of this, development will always be more of a bloodbath than design. That’s how my story became my daily filter. After story time, I would re-open my Hydra of To-Dos, try to prioritize the top 3 things I could accomplish based on the story I’d created. From there, I promise to spend at least two hours on the thing at the top of my list that day. Of course, there was swift collateral damage. Our small but scrappy design team could only handle a handful of design projects at a time, posing a bottleneck for development. We also de-prioritized clients that didn’t assign premium value to great design. We over-delivered on three app designs within a month that we believe our clients can raise money with. These jaw-dropping design prototypes allowed Topflight through doors we couldn’t squeeze toes into before, multiplying our margins by…you guessed it: 10! The practice helped me understand that not getting back to a client right away isn’t the end of the world. Even though we may not get to do all of the things we believe are going to add value for our client, the bigger reward is actually determining a focused, unified, singular way of helping our clients most. After being forced to delegate more, I am also more confident that my team is fully capable of doing just about everything I previously thought I had to do myself. All because I started telling my story. Now, I can focus more on how to further add value to the company. Exhibit A: I’m blogging again. Most Importantly: Telling my story has extended my runway significantly. It serves as a filter for what I pay attention to. Because of that, I’m so much happier and have so much more energy to pour into the work, even though the clock says I’m still spending just as many many hours on the work that I love. In short, my biggest fear with hyper-focusing was that I would get less done, and I was way off. Let your story guide your day, and not your day guide your story. This approach is not an avoidance of reality. The events of the day should not be ignored or rationalized. After all, you may stumble upon a situation, a client, a customer that rightfully changes everything. But that’s for tomorrow to judge, when you’re going back through the events and recalibrating them. 9 times out of 10, they’re not as important as they seemed. For today: it’s time to let you and your story be the master.